With only 48 sleeps until Christmas (whaaaaat?! ), I’m well and truly in the festive spirit. My Christmas shopping is in full swing, much like my ever-growing Christmas list and I’m even putting the tree up next weekend - yup, I’m *that* person. I’ve already watched Elf more times than I care to admit. So today I’m bringing you all a sneak peak into the things I’m lusting over this festive season. 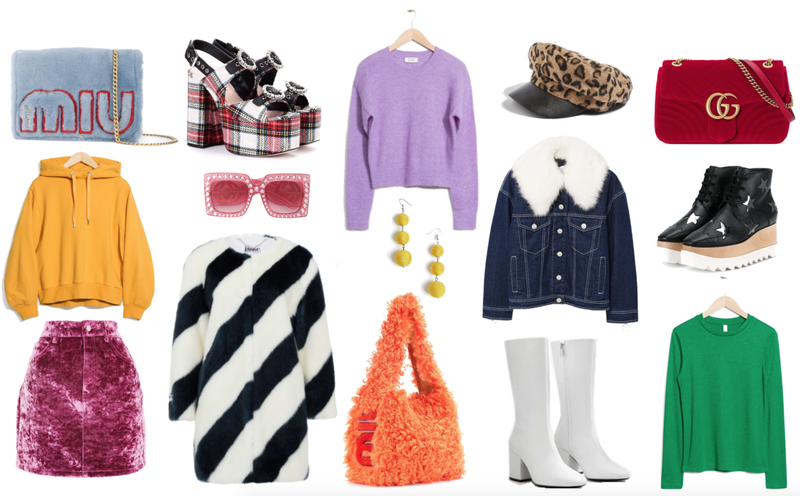 From faux fur coats to faux fur bags, velvet skirts to leopard print hats - you name it, I want it! Colour is something I’m trying to embrace even more over Winter. I think for a lot of people when the weather gets colder, it means clothing gets darker. But where’s the fun in that?! This year I’m championing ‘rainbow chic’. Perhaps a totally made up term by yours truly, yes, but it’s a trend I shall be championing nonetheless. Whaddya think? I’m seriously beyond excited for Christmas this year and all the fun styling possibilities the season holds. Let me know what you’re lusting after this month in the comments below, I’d love to hear! I love all of these picks. The pink sunglasses are so cute!